The war's over and Wistful Vista's back to normal -- or as normal as it can get with Fibber McGee around! "Himself" is waging campaigns against his finance company, a millionaire, and the United States Postal Service. Plus Doctor Gamble and Mayor LaTrivia are battling over Fifi Tremayne - who has troubles with prowlers�and a pair of suitors. 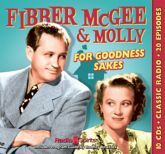 Jim and Marian Jordan lead the fantastically quirky cast - featuring Arthur Q. Bryan, Bill Thompson, and Harlow Wilcox - in 20 digitally restored and remastered episodes.